In our May edition of our Preemie Family newsletter we learned about the incredible Zachary, a preemie born at 28 weeks, 1 day who was 1 lbs. 15 oz. at birth and spent 155 days in the NICU. Read more in an update by his mother, Yamile. . .
On May 15th, 2001, Larry and Yamile Jackson had a baby boy who was born prematurely weighing less than 2 pounds and was hospitalized for five months. Three weeks after his birth, Zachary survived the deluge of Tropical Storm Allison that flooded his hospital in Houston and shut-down all power to his life-support equipment. Larry, Yamile, and the staff kept him alive “by hand” for 9 hours until he was evacuated. Against incredible odds, Zachary is not only alive, but he is also healthy, smart, funny, enjoys golf and gets in trouble like any other 11 year old. Zachary is an excellent student and this month he finished his first triathlon! His mother, Yamile (a PhD in ergonomics and human factors engineering) made a promise to Zachary that his pain and struggle to survive were not going to be in vain. 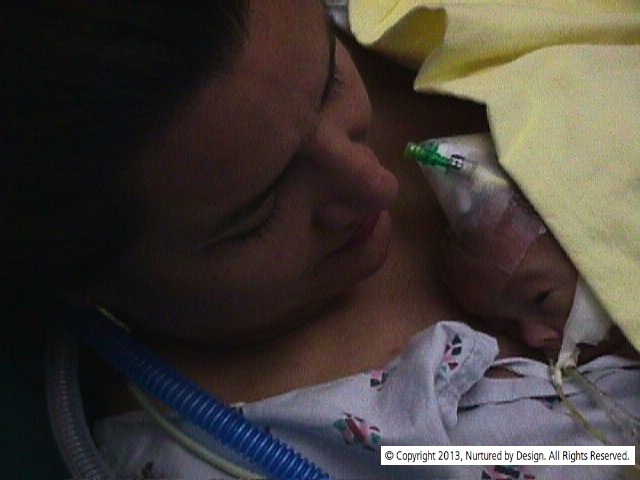 As a result, she founded Nurtured by Design (www.nurturedbydesign.com/NICU) and offers The NeurDevelopmental Care System which includes The Zaky and Kangaroo Zak (both named after Zachary) to provide 24/7 evidence-based developmental care with heavy family intervention and following ergonomic principles. Nurtured by Design is the only life-science and technology company that offers evidence-based ergonomic devices that help babies develop outside the womb, thereby helping reduce malformations and even brain deficiencies commonly attributed to prematurity (such as “preemies don’t like to be touched when they grow up”). Yamile’s designs and the safe implementation and support of kangaroo care help improve outcomes and reduce healthcare cost of NICU babies not only while hospitalized but for a lifetime. Zachary is the CIO (Chief Inspirational Officer) of Nurtured by Design and the work done on his behalf, and with his help, has received over 19 business or design awards and the company is currently nominated for the prestigious 2013 Corporate and Institutional Achievement Award by the Smithsonian’s Cooper-Hewitt National Design Museum. Is the company wins, they will go to the White House in October! Yamile was selected as one of the top 20 Latino Innovators of the Year and they were featured in the TODAY SHOW (http://alturl.com/r8hqu). Zachary is with Jenna Bush in the picture attached. Yamile proudly serves in the Board of Directors of the March of Dimes’ Houston District since 2011, is member of the Preemie Parents Alliance, and serves in the Parent Advisory Board in several hospitals. Zachary continues to be an inspiration not only to his family but to thousands of families around the world and is now old enough to feel proud and enjoy all the emails with testimonials and pictures they receive from around the world. Preemies no longer have to be sentenced to a life of solitude or deficiencies if we work hard in preventing them during the period when they are supposed to be in the womb. Zachary is a good example of that. Zachary with Jenna Bush HagerPhoto Credits:Nurtured by Design, Inc.